I'm stuck waiting for training to be an ACSO (Air Combat Systems Officer) in the CF, and therefore have a naked flight suit without any proper badges. However, they're going to be changing that soon, when we get an ACSO In Training patch! Or it's rumoured, at any rate, that they're going to hold a contest to design one. Which is good enough for me to start playing around with a few ideas on a lovely Saturday morning. The top one is my favourite, it's based on the t-shirt design I did for my platoon at basic.I finally fixed her head by tilting it back a little, which had always annoyed me. 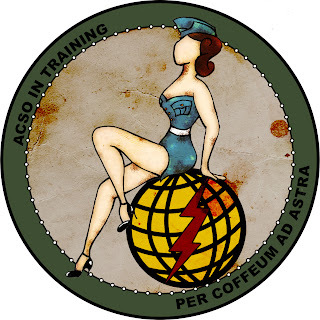 She's sitting on top of the ACSO (formerly Navigator) symbol, that we'll someday have on our wings. I used the same background and rivets as the t-shirt, keeping with the idea of 'nose art' as the inspiration. 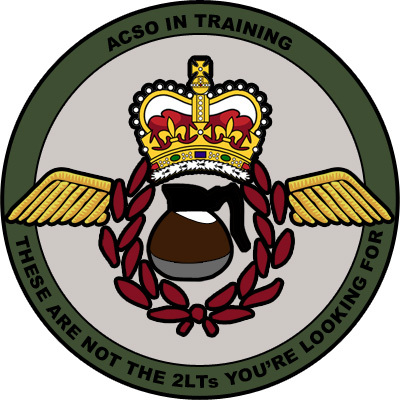 The phrase at the bottom is a play on the air force motto "Per Ardua Ad Astra" (Through Adversity to the Stars), changed to "Through Coffee to the Stars" because the running joke is, that, as we are just in make-work positions until our course starts, we do nothing but make other people coffee. This patch is a bit of a joke based on the coffee idea. I took the Navigator wings and replaced them with a coffee pot, and the Star Wars reference is because 2LTs (Second Lieutenants, our rank until we're qualified) tend to get tasked to do all the crappy jobs no one else will.